One of the questions job seekers frequently look for answers to is how to tell whether a work-from-home job posting is a scam or a legitimate work-from-home job. There are warning signs that can help you avoid getting scammed. In addition, there are some sites that can help you determine what a real work-at-home job is, and what isn't. Scams can also be an issue when looking for jobs that don't involve working at home. Job sites try to police the listings, but it's hard to catch all the bad listings in a timely manner. Be careful when reviewing postings to make sure that you're not taken advantage of by unscrupulous job posters. Check Out the Job Listings: If it isn't listed in the job posting, find out if there's a salary or if you're paid on commission. For work-at-home jobs, ask how often are you paid and how you are paid. Ask what equipment (hardware /software) you need to provide. You Won't Get Rich Quick (Really): Avoid listings that guarantee you wealth, financial success, or that will help you get rich fast. Stay clear of listings that offer you high income for part-time hours. They will do none of the above. Hang on to Your Money: Do not send money! Legitimate employers don't charge to hire you or to get you started. Don't send money for work at home directories or start-up kits. Check References: Ask for references if you're not sure about the company's legitimacy. Request a list of other employees or contractors to find out how this has worked for them. Then contact the references to ask how this is working out. If the company isn't willing to provide references (names, email addresses, and phone numbers), do not consider the opportunity. Think Twice: If it sounds too good to be true, you can be sure it is! Also, read any "offers" you get very carefully. One candidate for employment got a very detailed job offer from an employer. The only problem was that she hadn't applied for the job and buried deep within the lines was a request for her bank account information, so that the employer could pay her. It was a scam, of course, but with some of the well-written ones it can be hard to tell. Assembly Jobs: No, you can't make lots of money assembling craft kits or any other type of kits. You can waste money on a package to get you started though. Data Entry Jobs: You'll see lots of listings for data entry jobs. They are usually either position posting ads or a sales pitch for a kit that will get you started. Multi-Level Marketing: (MLM) which involves recruiting new people, and more new people, to sell the product. If all you are doing is trying to find more people to do what you're doing, keep in mind that there are probably thousands of other people attempting to do the same thing. Most of them aren't getting rich. Also note, that MLM isn't a job with a paycheck - it's starting a business, with no guarantees. Online Businesses: Do you want to start your own online business and get rich? Be very wary of these type of ads too. What you will do is end up paying for a guide to working at home which duplicates information you can find free. Posting Ads: There are lots of ads saying workers are needed to post ads on online bulletin boards and forums. You don't get paid to post, rather you may get paid if other people sign-up. Processing Claims: In order to get "hired" you'll need to buy equipment, software, and pay for training. Stuffing Envelopes: Believe it, or not, there are still people saying that you can earn $3 or $4 per envelope to stuff them. You can't. All major companies have postage machines which stuff, sort, and meter mail. The winner in the scam contest are the sites that offer to sell/provide you with information on only legitimate work at home jobs - for a nominal fee, of course. Don't do it! How do you find out if the posting you are responding to is legitimate or a scam? Check our Work-at-Home Scam information to research companies before you apply. If you've ever been taken advantage of, here's how to report a scam, along with the information you will need to file a report. 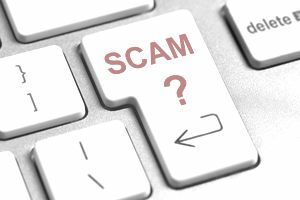 Typical employment, job search, and career-related scams, how to avoid scams, and what to do if you have been scammed.